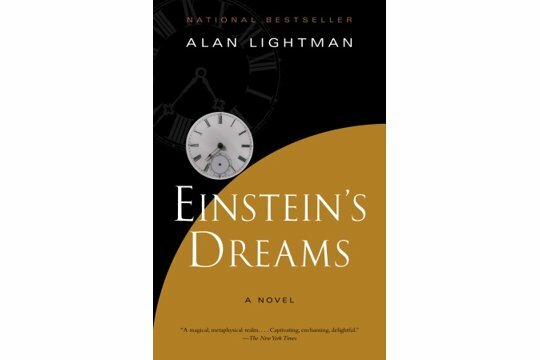 Indeed one of our favorite books, Einstein's Dreams by Alan Lightman is at once provocative and thought-provoking! We've bought so many of these as gifts, we thought we ought to start selling them ourselves! So, we are. "Suppose time is a circle, bending back on itself..."
A modern classic, Einstein’s Dreams is a fictional collage of stories dreamed by Albert Einstein in 1905, when he worked in a patent office in Switzerland. As the defiant but sensitive young genius is creating his theory of relativity, a new conception of time, he imagines many possible worlds. In one, time is circular, so that people are fated to repeat triumphs and failures over and over. In another, there is a place where time stands still, visited by lovers and parents clinging to their children. In another, time is a nightingale, sometimes trapped by a bell jar. Now translated into thirty languages, Einstein’s Dreams has inspired playwrights, dancers, musicians, and painters all over the world. In poetic vignettes, it explores the connections between science and art, the process of creativity, and ultimately the fragility of human existence. You must read this!